Our range of products includes complete coilers, coupling heads and spindles, sleeves, wrapper guide plates and drive spindles. Design & manufacturing of complete up- and downcoiler mandrel systems including all relative spare parts for mandrel systems used in hot and cold rolling mills as well as in aluminum rolling mills. Besides the manufacturing of complete mandrel systems Gustav Wiegard MASCHINENFABRIK upgraded its competence through specific investments into manufacturing 4.0 technologies and an enhanced GW | Network to the engineering and redesigning of complete Downcoiler and Upcoiler Mandrels also including the engineering, design and the manufacture of mandrel gear boxes. Gustav Wiegard MASCHINENFABRIK produces a wide range of drive elements such like mill pinions, articulated heads and spindles, pressure spindles, drive spindles, complete articulated spindles incl. slipper blocks and articulated spindle heads, adjustment spindles and toothed spindles. 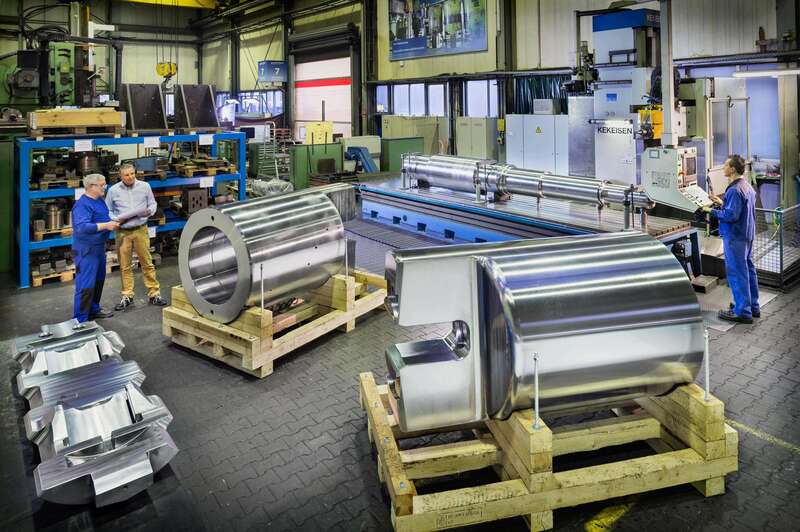 To sum up our scope of supply we also would like to stress that Gustav Wiegard MASCHINENFABRIK manufactures complete wrapper guide plates in various designs ready for installation with all accessories including the curved apron. We also offer our GW | repair services for this product. In addition, complete mill pinion gear boxes or the pinions as spare parts are manufactured by us in different dimensions ready for installation. Our product range covers mill pinions module 4 to module 30 made from high-quality forging material in ground quality and thermally treated.